Autumn has arrived! 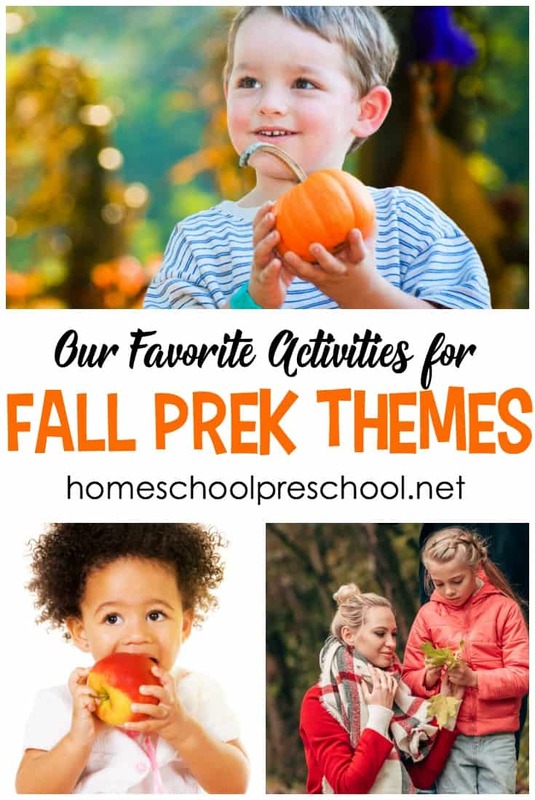 Celebrate autumn with this awesome collection of activities that will help you plan your fall preschool theme. The temperatures are dropping. The air is crisp, and the trees are on fire with shades of red, orange, and yellow. Pumpkins are everywhere. Squirrels are chattering as they hunt for acorns. The geese are heading south. Autumn has arrived! Celebrate autumn with this awesome collection of autumn activities and resources for preschoolers! From leaves and acorns to pumpkins and turkeys, there are so many fall themes to explore with your preschoolers. The hard part will be choosing which one to start with! Simple Scarecrow Craft and Book List – Autumn means scarecrows and sunflowers and great autumn read-alouds. Combine all of those things with this simple scarecrow craft and book list for kids. Autumn Count and Clip Cards Bundle – Fill your preschool math centers with these autumn count and clip cards. Crows, pumpkins, sunflowers, and leaves adorn the cards in this printable bundle! August Printable Preschool Activity Calendar – Be sure to grab your preschool activity calendar! Celebrate all of August’s holidays and special days with books, printables, and hands-on fun! Acorn Books for Kids – Teach your kids about acorns and oak trees this fall with this great collection of acorn books for kids. They’re perfect for your fall book baskets. Fall Fun Science Experiments for Preschoolers – Pumpkins, apples, leaves, and more! Come discover 20 engaging fall fun science experiments for preschoolers! 25+ Autumn Activities and Crafts for Preschoolers – Leaves, scarecrows, apples, pumpkins and more. These easy activities and crafts are perfect along side your autumn preschool lessons! September Preschool Activity Calendar – Don’t miss this month’s preschool activity calendar! Celebrate all of September’s special days with picture books, seasonal printables, and hands-on fun! Fall Patterns Preschool Activity – Learning patterns at an early age builds predicting, observation and analyzing skills. Try this simple fall patterns preschool activity! October Preschool Activity Calendar– Don’t miss the October preschool activity calendar! Celebrate all of this month’s special days with books, printables, and hands-on activities! 50 Free Fall Printables for Preschool – No matter what autumn themes you’re planning for your preschoolers, these fall printables for preschool will help you round out your units! The Best Activities for Your Apples Preschool Theme – Discover some fabulous resources that will help you plan your apples preschool theme. These activities are geared for kids ages 2-6. Perfect for preschoolers! 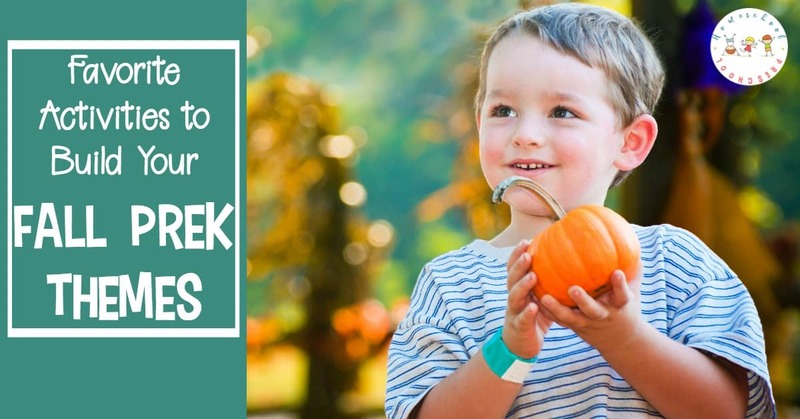 30+ Activities to Add to Your Preschool Pumpkin Theme – If you’ve got pumpkin on the brain this fall, you don’t want to miss any of these activities that will make a great addition to your preschool pumpkin theme! Easy Nutter Butter Acorn Cookies for Kids – Nutter Butter acorn cookies are so easy to make! Kids can do much of the prep work on their own. These cookies are perfect for your fall preschool themes and parties. 10 Really Adorable DIY Acorn Crafts for Kids – Get ready for fall this these adorable acorn crafts for kids! These do-it-yourself activities for kids are a fun way to celebrate fall’s arrival. 10 Fabulously Easy Fall Crafts for Preschool Aged Kids – Fall is just around the corner! Woohoo! You have to check out these amazing fall crafts for preschool aged kids. Which one will you try first? Hands-On Activities for Johnny Appleseed Day – Johnny Appleseed Day is celebrated on either March 11 or September 26. These hands-on activities will help you and your preschoolers join in the fun! Make a Leaf Family – This simple craft is perfect for tots and preschoolers! Best Picture Books About Leaves – I love reading seasonal favorites with preschoolers. It instills a new level of excitement for the changing seasons. Fall Leaves Preschool Printable – Here’s a fun leaf-themed learning pack for preschoolers. 20+ Leaf-Themed Science Activities for Preschoolers – As the leaves begin to change colors this autumn, it’s a great time to explore leaves with these engaging leaf-themed science activities for preschoolers. 25 Fall Leaf Crafts for Preschoolers – As the leaves begin to change colors, inspire your preschoolers to explore their creative side with these simple fall leaf crafts and activities. Autumn Leaves Activities for Toddlers and Preschoolers – If the leaves are starting to change colors in your area, add one or more of these autumn leaves activities for toddlers and preschoolers to your lessons! 20+ of Our Favorite Books About Leaves for Preschool – Come discover some of our very favorite picture books about leaves for preschool. Fiction and nonfiction books for beginning readers! Cinnamon Scented Fall Slime with Leaves – Amazing DIY cinnamon scented fall slime! This simple homemade cinnamon slime is perfect for kids of all ages! Make a batch today. Leaf-Themed Fine Motor Activities – Autumn is just around the corner. Help preschoolers build motor skills with these leaf-themed fine motor activities that are perfect for fall! Preschool Leaf Theme Math and Literacy Printables – Add these preschool leaf theme math and literacy printables to your autumn plans. Focus on the alphabet, numbers, and fine motor skills! 15 of Our Favorite Books About Scarecrows – Autumn is the perfect time to read about scarecrows with your preschoolers. This collection of scarecrow books for kids is a great place to start! Kids Scarecrow Crafts and Activities – Decorate your preschool room with one or more of these kids scarecrow crafts. They’re perfect for your autumn themed lessons. Scarecrow Themed Alphabet Worksheets for Fall – Encourage your preschoolers to practice the alphabet with this S is for Scarecrow alphabet worksheets. Perfect for your autumn literacy centers! Fine Motor Paper Plate Scarecrow Craft – Create this simple paper plate scarecrow for a cute fall craft for kids. With these step-by-step instructions, this scarecrow craft is so easy to make. 25 Awesome Halloween Crafts for Kids – An awesome collection of crafts your preschoolers will love! Not-So-Scary Halloween Picture Books – Kids will enjoy this collection of Halloween themed books that is full of silly stories – not scary ones. DIY Halloween Bat Treat Bags – Have a Halloween class party coming up, or will you have a Halloween party at home? You need these DIY Halloween treat bags with a free printable template! 4 Simple Tips for Keeping Kids Safe on Halloween – Are your kids gearing up to go trick-or-treating? Have you bought the costumes and the candy bags? Follow these simple tips for keeping kids safe on Halloween. Peanuts-Themed Halloween Activity Pack – Is Halloween really just a few weeks away? Here’s a fun Halloween printable activity pack for preschoolers. It features characters from my favorite Nutty gang! Spinning Spiderweb Salt Painting Craft and Counting Mats – Discover a great nonfiction spider book for kids, a fun salt painting craft, and a spider-themed math printable! Perfect for your October homeschool preschool. I’m Thankful: A Printable Gratitude Journal for Kids – Encourage an attitude of gratitude in your kids with this “I’m Thankful” gratitude journal. It’s perfect for kids of all ages this Thanksgiving season! Thanksgiving Preschool Printable – The latest version of my Thanksgiving learning pack. 25 Thanksgiving Preschool Crafts – Keep your little ones busy this holiday season with this fun collection of crafts. 20 Thanksgiving Sensory Activities for Preschoolers – Explore sensory play with these Thanksgiving sensory activities for preschoolers! What a great way to entertain kids this holiday season. Thanksgiving Preschool Numbers – These Thanksgiving number pages are the perfect addition to your homeschool preschool lessons. Your preschoolers will love practicing counting with these number activity pages. 20 MORE Thanksgiving Crafts for Kids – Are you looking for some cute Thanksgiving crafts for kids? Look no further! I’ve rounded up twenty amazing crafts that your preschoolers are sure to love!